Can LG's top L-style handset produce substance and style? L-style, but should that just be a L on it's forehead? If you want a decent, single core phone with all the main features you're better off looking elsewhere as the Optimus L7 sadly misses the mark. LG wants to bring design to the masses with its L-style range and has launched three handsets aimed at the fashion conscious consumer, the Optimus L3, Optimus L5 and Optimus L7. The LG Optimus L7 may be top of the pile in the L-style range, but don't let that trick you into thinking it's a high-end device ready to tackle the likes of the Samsung Galaxy S3 and HTC One X. It's not even competing at the level below, with the Optimus L7 priced at around £240 (around $375) SIM-free and free on contract from as little as £13.50, the handset is set to rub shoulders with the HTC One V, Nokia Lumia 710 and Orange San Diego. Like its L-style siblings, the LG Optimus L7 is an angular handset sporting a metallic boarder around the edge which LG claims has "exquisite style" – we're not sure if we'd go that far, and although the L7 is far from ugly, it's hardly the prom queen of the mobile world. LG boasts that the Optimus L7 uses its new "floating mass technology" – which to you and me means that the handsets curves in from front to back, giving the appearance that the handset is thinner that it actually is, as well as making it look like its floating above the surface it's on. It's hardly groundbreaking, with plenty of phones employing this styling method to give the illusion of a sleeker device – take a gander at the Panasonic Eluga or Galaxy S2 for example. 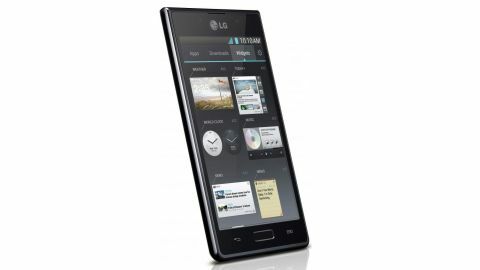 That said, it's not like the Optimus L7 is a chubby handset, measuring just 8.7mm in depth, it easily slips into your pocket – and tipping the scales at 121g give it a reassuring weight. The Optimus L7 does feel well made, and the sturdy chassis refused to flex when we exerted pressure on it. On the front you get a 4.3-inch WVGA (800x480) display, with a physical home key below it, flanked by back and menu touch buttons. Above the screen is a front-facing VGA camera and light sensor – competing a fresh, minimalist look. Move to the top of the Optimus L7 and there's a power/lock key opposite a 3.5mm headphone jack. The power/lock key can be a little troublesome to reach at times, with the angular shape of the Optimus L7 proving difficult to manipulate in your palm – which is better suited to more rounded edges. The volume rocker on the left hand side is easier to hit, which wraps up all the physical buttons on the handset. At the base of the Optimus L7 you'll find a microUSB port and a small hole for the microphone, with nothing to report on the right hand side. Flip the LG Optimus L7 over and the textured plastic back carries on the simple and clean layout, with just a 5MP camera next to a single LED flash and small speaker grill in the bottom left to note. Picking off the plastic back plate requires a finger nail to be slid between case and frame, so could prove a problematic experience for those who like biting theirs. The black plate is made of relatively thin plastic which can be easily bent in the hand, so make sure you treat it with care, especially as it houses the Optimus L7's NFC antenna. You can stick your full size SIM-card into the Optimus L7, with LG not choosing to go down the microSIM route, plus there's a handy slot for a microSD card if you need to expand on the 4GB of internal storage. Thankfully both SIM and microSD card can be inserted and removed without having to disturb the 1,700mAh battery – which itself can also be taken out, useful if you need to do a hard reset or like to use multiple power packs.